Offering content, or even a full website, in multiple languages means you can tailor your information to different audiences but it can add complexity to development. Translating content is the simple step but things can get tricky when it comes to structuring and building a multi-lingual website. For e-commerce sites in particular, this often means adding support for international shipping and incorporating additional languages into online shops. Then, there’s also the matter of sorting out domain names, web server configuration, URLs and webpage layouts while keeping in mind all facets required for having multiple languages. If nobody on your team possesses the skills to translate into your target languages, then you need to hire a qualified translator. Avoid automatic translating apps, as they tend to produce mediocre copy and don’t always incorporate accurate grammar and phrasing. Ideally, you should aim to get a native speaker of the language. They are going to understand the quirks and nuances specific to a language and avoid stiff or unnatural language during translations. This is especially important when it comes to business jargon or colloquialisms. 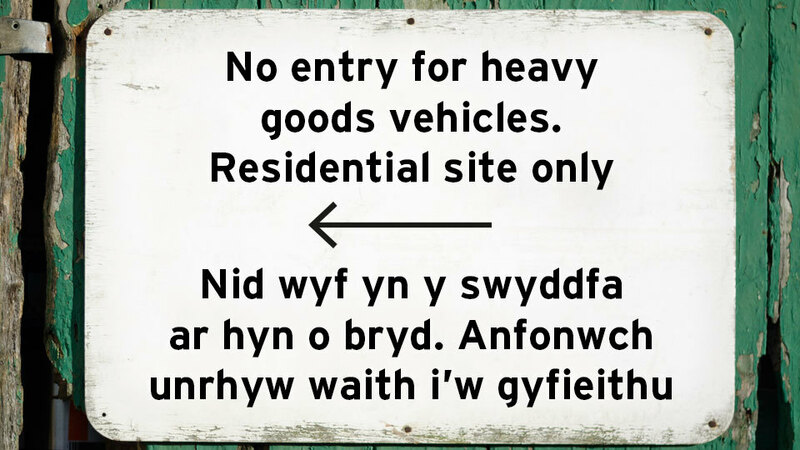 The image below shows an actual road sign in Wales that has been lost in translation. The English is clear but the Welsh reads: “I am not in the office at the moment. Send any work to be translated.” It demonstrates the importance of proofreading everything you get translated. In most cases your website should be able to automatically assign a language based on a user’s location but you could also include a landing page or pop-up that allows users to select their preferred language. Some websites offer pull-down menus, tabs or even icons of flags for specific countries that allow users to switch between languages. Flags are a universal language that, in many cases, are easy for a user to identify when looking to update their language settings. When making your choice, it’s also important to consider site usability and function. Make sure you consider mobile and tablet users and how people will arrive at your site. Whatever you choose, make sure it’s easy for visitors to your website to choose their preferred language. It’s important to note that duplicate content could arise when you have variations of the same language in different locations across your website. This can be detrimental to the search performance of your site in the eyes of search engines like Google and Bing. To prevent these issues, it’s best to identify a preferred language for each location with html ‘hreflang’ tags. Google recommendsusing the rel="alternate" hreflang="x" attributes to serve the correct language or regional URL in search results. When you keep the main content of your website in a single language and only translate the template, such as the navigation and footer. When your content has minor variations of the same language such as the English language targeted at the United States and Australia, for example. When your website content is fully translated and you have different versions of each page available in different languages. For further reading, there are some helpful guides available online (here and here) which cover best-practice for international sites. When you’re developing a website for multi-lingual support, you could find yourself in a situation where a particular language isn’t able to render correctly because the wrong font is being called up. It’s also important to carefully consider the fonts you use on your website to ensure they’re compatible with all the languages you provide. Some languages, such as non-Latin based languages, include hundreds of characters so it’s wise to choose a font that contains all the characters and glyphs you need. 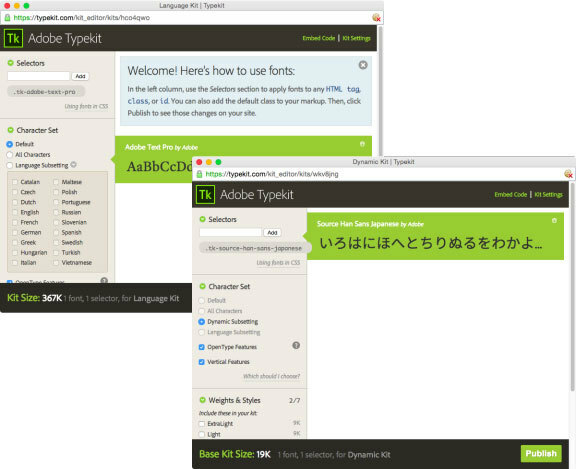 Online font subscriptions services like Typekit (below) offer a useful range of multi-lingual fonts with filtering tools to find what you need. Did you know that the script a language is written in can have different directions? For example, Arabic script is one of the most widespread right-to-left (RTL) writing systems, while English is left-to-right (LTR). The direction of script can have an impact on the entire layout of your website, including images, text, navigation, sidebars and so on. A RTL script will essentially mirror the layout of a LTR script. For content, you can specify the direction of text using the <dir="rtl"> attribute which is supported by all major web browsers. The above tips are only a few of the most obvious concerns that need to be addressed when creating a multi-lingual website. If you’re serious about getting it right, then it’s best to seek the assistance of an experienced team that can help with everything from translation to back-end encoding for your website. Do this and you’ll end up with a sleek, multi-lingual website that can accurately communicate with your customers, irrespective of their location. 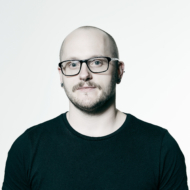 Do you need software experts to help create a website for different languages? Inoutput can assist. Call (03) 9016 3066 or send us details about your project via our contact form.